This 10,000-12,000 BTU portable shower from Mr. Heater has an external battery pack that is powered by 4 D-Cell batteries and will power through 6 five minute showers. A 1 lb disposable cylinder connects directly to the included pre-calibrated regulator to deliver over 115 minutes of hot water on high. The included quick connect pump and shower head deliver an average of . This 10,000-12,000 BTU portable shower from Mr. Heater has an external battery pack that is powered by 4 D-Cell batteries and will power through 6 five minute showers. A 1 lb disposable cylinder connects directly to the included pre-calibrated regulator to deliver over 115 minutes of hot water on high. 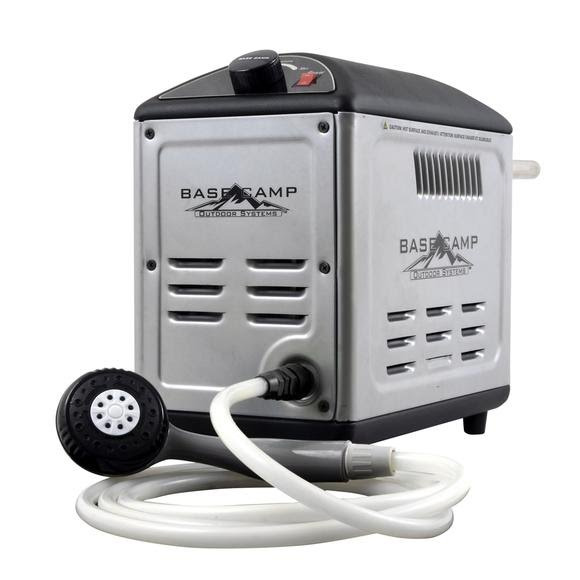 The included quick connect pump and shower head deliver an average of .6 gallons per minute, ensuring that your shower is as good when roughing it as it is at home.